Brand New. Factory Sealed. Still in Box. 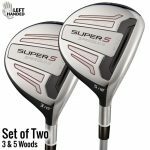 Adams SUPER S Black Lefty Fairway Woods. Set of Two! 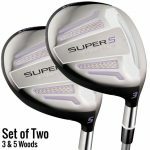 Adams SUPER S Black Ladies Fairway Woods. Set of Two! 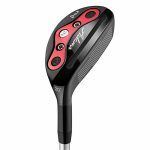 New Adams Golf XTD Tour LTD Iron Set. Originally, the set sold for $650! With this set, you'll receive a full set of six irons: the 6/7/8/9 irons PLUS the pitching wedge and the #5 DHY Pro Hybrid (24 degrees). 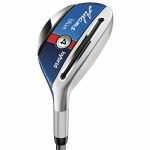 Play the irons that Ernie Els plays and that won him the Northern Trust Open! The Adams XTD Tour Irons feature the industry's first-ever cross-cavity design, combined with Cut-Thru Slot Technology, to create distance through technology instead of strengthened lofts. Constructed for players of all skill levels, XTD Tour Irons boast a center of gravity (CG) moved off the face to generate gear effect similar to a hybrid. Club engineering promotes ideal launch angles throughout the set, with explosive height off of the face, penetrating ball flight and more preferable descent in attacking the pin. An industry-first cross-cavity technology helps keep errant-struck shots on their proper path. Pressure Piston to soften vibration and sound after contact, a face impact damper dramatically decreases vibration for unmatched feel and sound. Players will immediately take note of the improved alignment on XTD Tour Irons. Framed scorelines include a polished finish to set the club on its correct line at address.